504 Main by Holly Lefevre: Grab a Cocktail and Join the Party! It is my turn at Willoughby's Blog Style Cocktail Party. 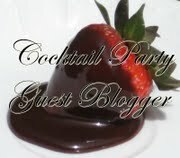 this FABULOUS cocktail party for bloggers. I have been introduced to so many new blogs. It has been great fun...Yipppeee! and join the party at This Stop Willoughby! You did a great job over there! You make such a nice guest. You did yourself proud, Holly! Good job! What a great idea Willoughby had to do a special party like this. I like it. I also enjoyed your post! What fun! stop over for a visit sometime would love to have you.